You can hire a bike from us for the duration of your mountain bike trip. If you decide to bring your own, you'll need a well-maintained mountain bike with, as a minimum, front suspension and disc brakes. If you have any doubts about your bike's suitability, do ask us. See the Kit List for advice on spares and accessories to bring with you. 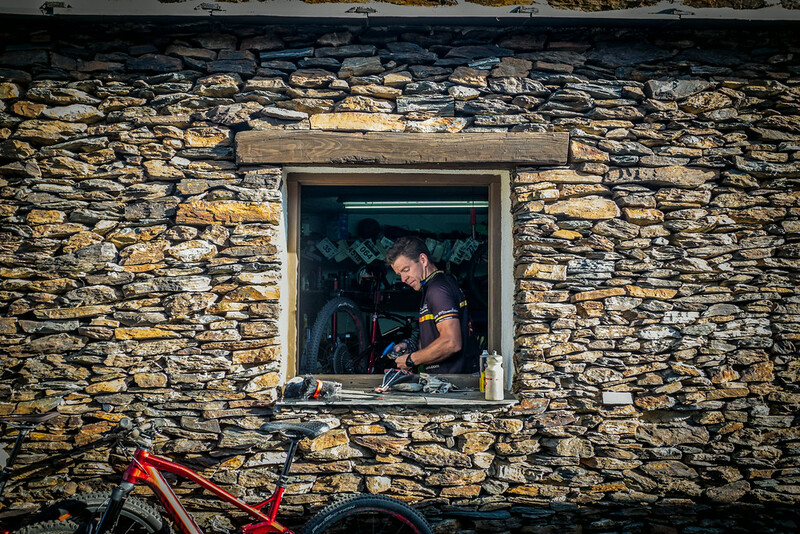 We have a fully-equipped bike workshop, staffed by super-mechanic Tim, and are happy to help you keep your bike running smoothly while you're here. Have the bike serviced by your local bike shop. Remember you're going to be riding it hard for several days on challenginig trails. Check the wear of the brake pads. If worn to the metal, replace them and bring two spare pairs. Check the wear of the tyres. If there are signs of the fabric under the rubber on the sidewalls then replace them. See our Kit List page for advice on appropriate tyres. Check that there are no leaks from the forks or the shock. Hold the cranks and push them in towards the frame - any movement and the bottom bracket is loose and could need tightening/replacing. Use a special rigid bike box or get a cardboard bike box from your local bike shop. Usually they are happy to set one aside for you. Then follow these steps, or ask your bike shop to pack the bike up for you. Remove the front wheel and pedals. Place a small piece of card between the brake pads to keep them apart. Lower the seat post to its minimum height or remove it if necessary. Detach the handlebars (not stem) and tape/ziptie them to the top tube. Turn the front forks rearwards. Move the rear derailleur so that the chain is on the largest sprocket at the back, and the front derailleur (if you have one) so that the chain is on the smallest chain ring at the front (this is to protect the derailleurs). Wrap the front chain rings and rear sprockets in bubble wrap. Place the bike in the box and place the front wheel alongside the frame. Pack spaces in the box with clothing/camelbak/helmet etc (unless this is prohibited by the airline's conditions). Remove disc rotors (if using a soft bag) and carry separately. Protect all exposed areas with bubble wrap. If using a soft bag, place bike upside down in bag. It's a good idea to line the bag with a cardboard bike box for extra rigidity if it's a soft bag. Don't forget to check with the airline at the time of booking what their conditions are on bike carriage. They do vary in terms of booking, cost and packing requirements.